JUST IN: Supreme court declares Makarfi’s group authentic faction of PDP – Royal Times of Nigeria. The Supreme Court led by CJN Walter Onnoghen, today Wednesday has declared the Makarfi’s group as the authentic faction of the Peoples Democratic Party, PDP. 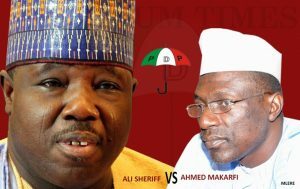 Sheriff was declared the chairman of the party by the Court of Appeal, but the Supreme Court verdict today has recognised Makarfi’s faction. Justice Bode Rhodes-Vivour reading the lead judgment of the Supreme Court on the PDP leadership tussle held that Sheriff had presented himself for PDP Convention and was disqualified and he decided to rely on existing judgements. The apex court also said that the National Convention of PDP was not held in disobedience to any Court Order. The court affirms Makarfi’s group the authentic faction of the PDP and fines Sheriff for losing the case.